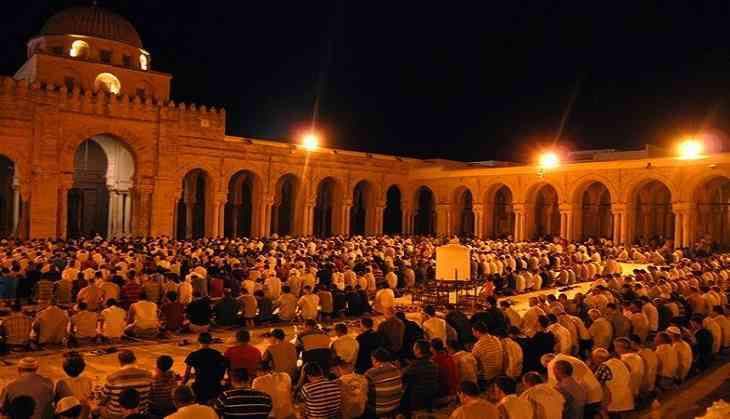 "Ramadan is, in its essence, a month of humanist spirituality," observes Swiss philosopher Tariq Ramadan. # Dates - Sweet and chewy, dates are considered an important part of any Iftar meal. Typically, those observing Ramzan break their fast in the evening with water and dates. Rich in essential nutrients such as vitamins, minerals, protein, and natural sugars, they boost energy levels. # Badam milk - Badam or almond milk is a healthy and refreshing beverage relished during Iftar. This popular drink is usually consumed chilled and can be prepared at home easily. Just soak almonds overnight then blend them in a grinder with milk and sugar/honey. Those with lactose intolerance can use soy milk instead. # Smoothies/ Milkshake - Another popular beverage at Iftar parties are smoothies or milkshakes that reinvigorate the body. They can be flavoured with fruits or syrups and accompanied with almost all Iftar snacks. # Mathri - Mathri is a popular namkeen, generally consumed with tea or coffee. It is a popular snack during Iftar and can be paired with a variety of chutney and other condiments. # Samosa - The humble samosa has gained popularity worldwide for its crisp exterior and delicious filling. A favourite at Iftar celebrations, it can be made with different stuffings. # Kebabs - No Iftar meal is complete without kebabs made with grilled minced meat. Such parties usually serve an assorted platter and it forms a major part of the meal. While most kebabs are meat-based, vegetarians can enjoy variations made with vegetables or paneer. # Fresh fruits - Fruits too are an important part of Iftar. Fresh seasonal offerings such as mangoes, watermelon, muskmelon, and plums can be served as they are or as fruit chaat/salad. There are many varieties available of the same fruit -- Dasheri from Malihabad, Banarasi Langra from Banaras, and Banganpalli from Rayalaseema are among the most popular mangoes. # Anjeer barfi - Anjeer barfi/katli is a healthy sweet, containing vital nutrients such as vitamins A, B1 and B2, calcium, phosphorus, iron, and potassium. A favorite among kids and adults, it helps limit the consumption of simple sugar in one's diet. # Nan Khatai - Nan khatai is a perennially popular shortbread biscuit/cookie in India, Pakistan, Afghanistan, and North-east Iran. It makes for a delicious tea-time snack and tastes even more special when smeared with jam. # Dry-fruit treats - Another alternative to conventional sweets are those made with dry fruits - healthy and easy to digest. There is a mind-boggling array of these available both online and at sweet shops. The former also offers consumable items such as namkeen, chocolates, bakery items, and more in one place - so that you can easily stock up your pantry for Ramadan without having to step out.